Another week, another kitteh birthday. Just a week younger than his adoptive brother, Kismet turns four today. He’s certainly grown up, outweighing elder brother Packet by at least three pounds. He stands head and shoulders taller than Mycah. He’s the largest cat I’ve ever had. 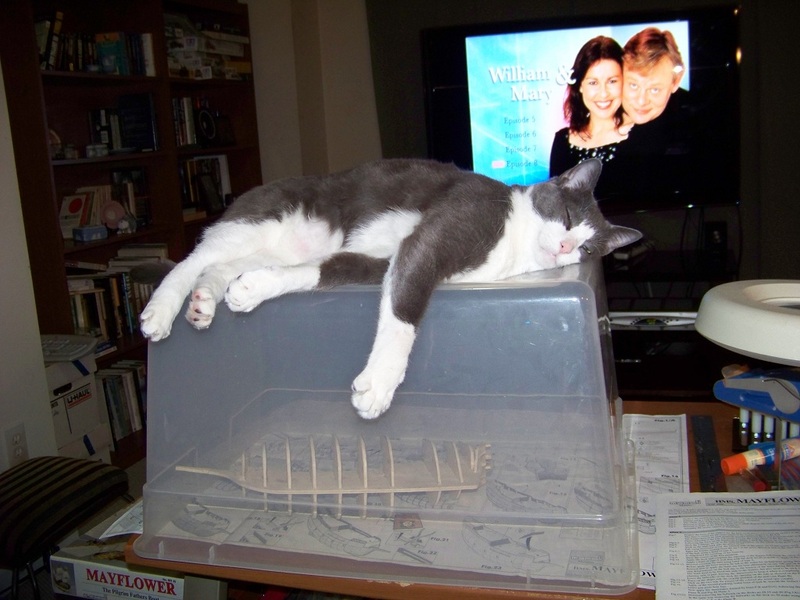 Here, he emulates his brother’s behavior, preventing me from working on my ship model. I hope for many happy returns of the day. Happy birthday, Kismet! We saw the link on the CB and came to wish you a fabulous day. We hope you get lots of extra treats, new toys, and even a nip party! Happy Birthday, Kismet!! Looks like you are having the purrfect day! !